White-sand beaches, turquoise waters and palm trees come to mind when we think of The Caribbean, but in Curaçao there’s a rawness of a different kind. Yes, there are gorgeous beaches, but the countryside resembles much of the U.S. Southwest with the abundance of cacti, and mountains that you can see as you’re descending on the island. 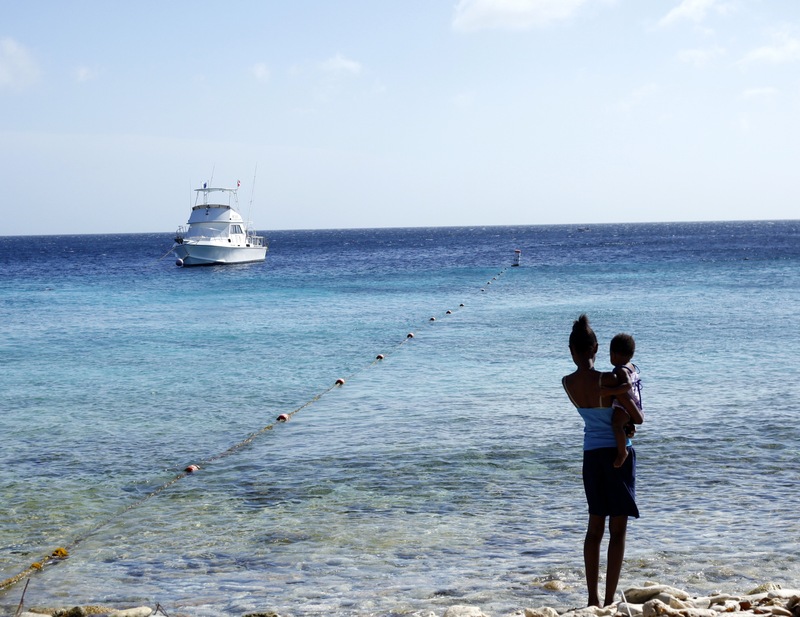 In June 2015, we started our six-day adventure in Curaçao. Driving north after renting a car at the airport, one of the first things we noticed were the incessant signs for the near-empty “bushaltes” (bus stops). These only typically seat two people, and offer little reprieve from the 88-degree heat. We did see some buses, but they were few and running more frequently closer to Willemstad. Curaçao is by no means a dense place. Undertaking the windy, uphill roads in a tiny Chinese-made Toyota knock-off (often laughing and hoping the manual car wouldn’t stall), we passed a desert-like countryside adorned in colorful, yet frequently-abandoned homes. No matter where you are on the island, Mount Christoffel is always in sight with an uncanny, humorous resemblance to Mount Doom. As we drove on, we’d see locals sitting on porches often laden with household appliances as an extension of their homes, and with old, destroyed cars in the driveway. Sometimes, locals braved the heat and walked the roads by foot, but mostly gathered together in smaller groups outside of local grocery shops in an effort to hide from the sun. Curaçao is not pretentious. Whereas Aruba is filled to the brim with all-inclusive resorts and Bonaire is almost entirely a scuba-diving island, Curaçao is trying to be more real with industrial plants and a port to go along with its tourism. Part of the beauty of the island is not found in its all-inclusive resorts, but rather in the small, secluded coves by which you can explore a separate, underwater world. What you’ll find is some vibrant underwater life, but there are restorative efforts made to bring back the coral reefs that once were. Willemstad, a UNESCO World Heritage Site and city that boasts a population of 150,000, offers quite a different vibe from the countryside. Its history, working harbor entry, and colorful, pastel architecture with Amsterdam-esque features in the quarters of Punda and Otrabanda tell a rich story. The city center offers some small shops and cafes, and is home to museums and to the oldest synagogue in the Americas, Mikvé Israel-Emanuel, built in 1732 and still in use today. At night, architectural details are accentuated in dimly-lit streets through street art or ‘spotlights’ on the colorful buildings. Little and narrow alleyways take you around the city center like a winding maze, where you can stumble upon a range of local Caribbean fare cafes, Asian cuisine (Indonesian, Indian and Chinese, especially) and Dutch food. When we visited, there were restoration efforts, to recapture the beauty of the older buildings. Curaçao is full of surprises. Its rugged terrain, interesting wildlife, beaches, friendly locals, and history and culture all contribute to making it a unique island to visit in The Caribbean. It’s not just a place to enjoy beautiful beaches. It’s not simply a tropical island. I think to fully appreciate its beauty and all it has to offer, it’ll require some research ahead of time, talking to locals, and having an openness and spontaneity to explore city and countryside. Thanks, Marta! Not sounding like a stalker at all, hehe! I’m so glad that the post conveyed to you exactly how I felt about it being such an interesting place. I, too, wouldn’t be compelled by all-inclusives (though can understand the appeal to an extent), but loved the realness and raw quality of Curacao! I loved this post, Nicolette. It’s so refreshing to read about a place in the Caribbean that’s not been engulfed by tourism and that’s a bit off the beaten track. Plus, your photos are fantastic. Thanks so much, Kirsty! I appreciate your kind words about the photos, and I’m glad you could get that sense of place about Curacao from the post. 🙂 It really was a great trip!